Research led by Anna Buchman in the lab of Omar Akbari, a new UC San Diego insect genetics professor, describes the world's first "gene drive" system–a mechanism for manipulating genetic inheritance–in Drosophila suzukii, a fruit fly commonly known as the spotted-wing drosophila. As reported April 17 in the Proceedings of the National Academy of Sciences, Buchman and her colleagues developed a gene drive system termed Medea (named after the mythological Greek enchantress who killed her offspring) in which a synthetic "toxin" and a corresponding "antidote" function to dramatically influence inheritance rates with nearly perfect efficiency. "We've designed a gene drive system that dramatically biases inheritance in these flies and can spread through their populations," said Buchman. "It bypasses normal inheritance rules. It's a new method for manipulating populations of these invasive pests, which don't belong here in the first place." Native to Japan, the highly invasive fly was first found on the West Coast in 2008 and has now been reported in more than 40 states. The spotted wing drosophila uses a sharp organ known as an ovipositor to pierce ripening fruit and deposit eggs directly inside the crop, making it much more damaging than other drosophila flies that lay eggs only on top of decaying fruit. 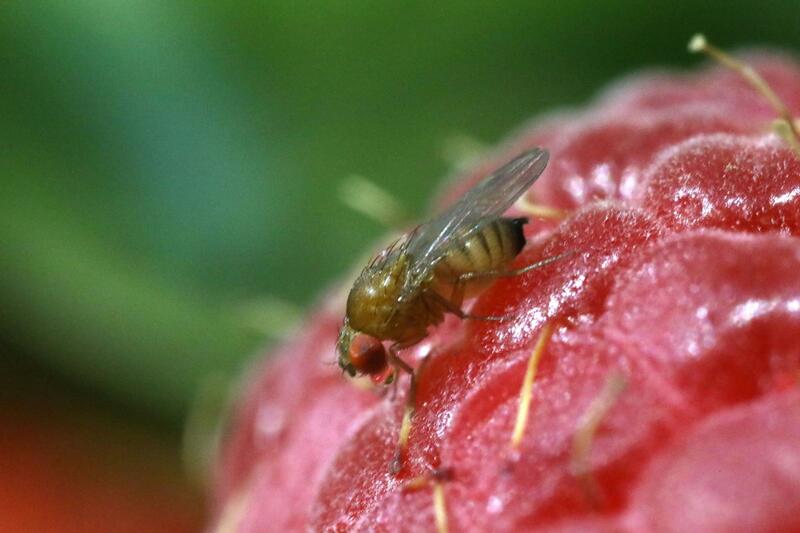 Drosophila suzukii has reportedly caused more than $39 million in revenue losses for the California raspberry industry alone and an estimated $700 million overall per year in the U.S. In contained cage experiments of spotted wing drosophila using the synthetic Medea system, the researchers reported up to 100 percent effective inheritance bias in populations descending 19 generations. "We envision, for example, replacing wild flies with flies that are alive but can't lay eggs directly in blueberries," said Buchman. Applications for the new synthetic gene drive system could include spreading genetic elements that confer susceptibility to certain environmental factors, such as temperature. If a certain temperature is reached, for example, the genes within the modified spotted wing flies would trigger its death. Other species of fruit flies would not be impacted by this system. "This is the first gene drive system in a major worldwide crop pest," said Akbari, who recently moved his lab to UC San Diego from UC Riverside, where the research began. "Given that some strains demonstrated 100 percent non-Mendelian transmission ratios, far greater than the 50 percent expected for normal Mendelian transmission, this system could in the future be used to control populations of D. suzukii." Another possibility for the new gene drive system would be to enhance susceptibility to environmentally friendly insecticides already used in the agricultural industry. "I think everybody wants access to quality fresh produce that's not contaminated with anything and not treated with toxic pesticides, and so if we don't deal with Drosophila suzukii, crop losses will continue and might lead to higher prices," said Buchman. "So this gene drive system is a biologically friendly, environmentally friendly way to protect an important part of our food supply." Coauthors of the paper include John Marshall of UC Berkeley, Dennis Ostrovski of UC Riverside and Ting Yang of UC Riverside and now UC San Diego. The California Cherry Board supported the research through a grant.